This Georgian style banquet dining table includes two half round hall console tables plus a dropleaf center section, signed "Made in England" and "Metal plate" and sold by "Lammert Furniture Co. of St. Louis" about 1920. 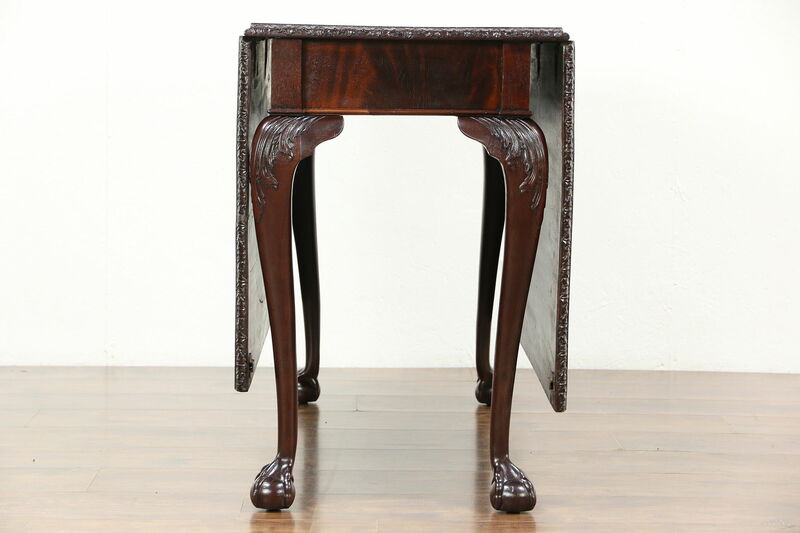 The restored finish is in excellent condition on this richly carved solid mahogany antique furniture. There are shrinkage separations from age plus warps in the wide mahogany plank tops. Brass "forks" connect the three sections. "Gate legs" swing out to support the drop leaves on the center section. Measurements of the hall consoles are 42" wide, 22" deep and 29" tall Overall length with both dropleaves raised is 8'9".